Calling all FYC members for the last hurrah of the season! In keeping with a more low-key ‘dinner on the deck’ style, the Committee would like to welcome members and their guests to an Easter Saturday night get-together. To keep this simple, please BYO everything as per the Friday night Twilight Dinners. No lasagna competition this year but bring a lasagna if you’d like and join us for a very relaxed end of season chinwag and bonhomie. Please remember to take home all of your bottles and rubbish as there will be no bin service this weekend. No need to RSVP, just come along, visitors and guests welcome! It’s that time of year where we salute and pay accolades to all the FYC Stars of Sailing over the 18/19 Season. Our very own “Oscars”. 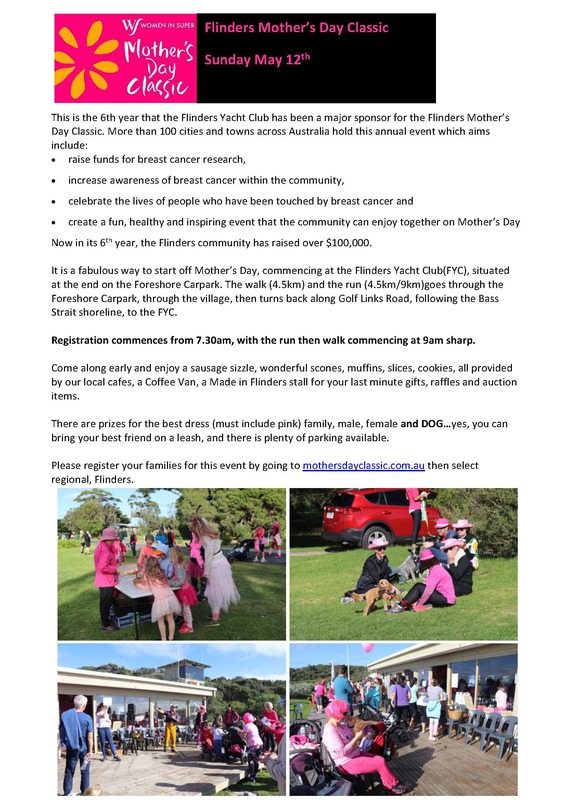 Always a fun night, this year will be slightly different as we have prevailed upon the Flinders Golf Club to allow us the use of their dining room to hold this event. This is due to the impending renovations at FYC. We will have a delicious dinner followed by the presentations. We look forward to seeing you there and sharing the tributes to those that have achieved greatness this season.